On the way back to Arequipa from Cabanaconde and Cruz del Condor on July 30th, our driver had us stop at the town of Santa Ana de Maca, whose main attractions are a small church and photo opportunities offered by enterprising locals. Maca, located at 3262 meters (10,702 feet) above sea level, is a small town at the foot of Sabancaya volcano. In 1609 it was made the seat of the colonial bishopric of the region. Today the town lives from farming and a small share of the tourist economy. The church was built in the 1600s, out of sillar, the white volcanic stone that is characteristic of the region's architecture. It was rebuilt after it was partially destroyed by a fire in 1759. When we arrived there was a mass going on, and although we were not prohibited from entering, I hung back by the entrance for a bit. I was able to catch enough of the mass to realize that it was a misa de cuerpo ausente, a funerary mass marking an anniversary -likely one month- of someone's death. I chose then to exit and return later. Outside, however, I was annoyed at a gaggle of European tourists who hung about snapping pictures of the parishioners and mourners as they left, particularly of the women dressed in the colorful traditional attire. I did realize that they had no idea of the solemnity of the occasion, nor were they dissuaded by their own guide, but it still bugged me. The inside of the church itself is relatively ornate in contrast to the outside, but still less so than so many other baroque churches in Peru. It reflected a small town's best attempts, and evoked a prosperity long gone. On each side of the nave there were effigies of saints, including a saint (Santa Ana?) 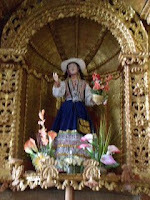 in local attire and a 17th Century life-sized Christ the Nazarene. There are also paintings of the Cusqueno school and plenty of gold leaf. To the left of the altar, in a side nave, there were stored the andas, or litters, upon which the effigies are carried in procession through the town on their holy days. Also kept there was rather detailed, life-sized effigy of the dead Jesus in a glass coffin, no doubt for the Easter Friday procession. Being at the foot of the volcano and near a geological fault that transects the valley, the church of Maca has suffered damage throughout the centuries. Fortunately it was declared a national treasure in 1980 and has been restored and maintained through funding provided by the Spanish crown. Next to the church a couple of locals had trained eagles to stand upon tourists' arms, knees, shoulders, or heads. He requested a donation for letting one take pictures with the birds, and no doubt garnered far more that way than if he had requested a set amount. The birds themselves were quite handsome and surprisingly heavy, as well as patient. After a few minutes of this we reboarded the bus and continued our way back to Arequipa.